Ethical Humanist Society of Long Island: Should There Be Limits On Speech? “Free Speech: Should There be Limits?” is the topic of a panel discussion to be held at the Ethical Humanist Society of Long Island on Sunday, June 21 at 11 am. The Ethical Society is located at 38 Old Country Road in Garden City (at the western end of Old Country Road, between Mineola Boulevard and Herricks Road). The Ethical Humanist Society of Long Island is honoring three Long Islanders for their commitment to the betterment of the world-activist David Sprintzen, journalist Bob Keeler and legislator Michelle Schimel. On Thursday, May 14, the three will receive the Ethical Society’s Social Justice Leadership Award at a dinner to be held at the Nassau County Bar Association, 15th and West Streets, Mineola at 6 pm. My name is Becca and I am currently an intern with LIPC. I entered this position in January during my last undergraduate semester at LIU Post, where I study sociology. At the end of this year I will be graduating from college and entering the real world. Everyone’s dream is to find a job in their field straight out of college. In my recent job search I have noticed something concerning; there aren’t many positions, at least not for someone holding a bachelors degree. Most positions require a Master Degree or higher. That is at least another two years of school that I would have to pay for while working at a job that doesn’t pay me enough to afford rent let alone pay for graduate school. At 22 I am at that age where living with my parents is no longer desirable. However, as a Long Islander that is essentially my only option. Not only are there few jobs available to me but the salary rates do not match up with the average cost of living on Long Island. While thinking about my future it seems to me like the most feasible option is to move out of the state. Long Island is my home, it is where I was born and it is where I’ve continued to live for the last 22 years. My parents, my sister, and my friends are all here. It is sad to think that I may not be able to afford to live on this island I call my home, because let’s face it; Long Island is not affordable; especially for people like me. It is important that we bring affordable housing to Long Island. It is not just you people who are struggling. Senior citizens cannot afford to pay property taxes on their homes. When they are forced to move due to high costs it is nearly impossible for them to find affordable rentals. Families, who make less than 100,000 dollars a year, cannot afford to buy homes here. So even though they are not poor they have no place to live. Through LIPC’s Yes in My Backyard campaign (YIMBY) we a bringing affordable housing to long island one community at a time. LIPC encourages communities to reach out to their town officials to make sure they know that affordable housing is important to Long Islanders. After coming to intern with the Long Island progressive coalition I realized how pressing these issues are for many Long Islanders. There are many people holding down jobs that don’t pay them a livable wage and the cost of housing here is astronomical compared to other states. The Long Island Progressive Coalition fights to ensure that people have good paying jobs, affordable housing, and other equal opportunities, regardless of their race or where they live. It is amazing to know that I became involved with an organization that helps fight for people like me and I am glad to be helping fight for a better future, not just for myself but for all Long Islanders. I recently attended a public hearing about the 2014 New York State Energy Plan. Governor Cuomo has said that he wants New York to cut greenhouse gas emissions 80 percent by the year 2050 from 1990 levels, and achieve a 50 percent cut by 2030. The plan includes several initiatives that will make this goal feasible. However, most of the testimonies at the hearing were about what was missing in the plan. They urged the governor to aim attention at renewable energy such as wind, solar, hydroelectricity and geothermal power. Most of them also talked about how far ahead Europe is when it comes to energy innovation. The hearing caused me to think a great deal about differences in energy policies in Europe and the US, and the role of renewable energy. The US gets 85% of their energy from fossil fuels like petroleum, coal and natural gas, and is one of the world’s largest producers of greenhouse gases. While the US has focused on strategies to secure more oil and gas, Europe has been leading the way when it comes to transitioning from fossil fuel to clean, renewable energy. Several European countries demonstrate that it is possible to implement policies and offer incentives that are effective in encouraging investment in renewable energy sources. In Europe the energy policies seems to be environmentally based, while in the US energy policies are economically based. Americans are still in denial about the causes and effects of climate change. They set climate protection against economic growth, and of course nothing is more sacred than economic growth. American policy makers endorse quick fixes that ignore the actual market and technology for renewable energy that is available. European countries have simply been better at using government policies and the private sector to make clean energy accessible for businesses and consumers. The results are windmill farms, tidal turbines and solar panels all over the European landscape. Incorporation of green policies can also be seen in people’s day-to-day life. Being a resident of a European country myself, I can attest to the different attitudes to the benefits of living green. My parents recently installed a geothermal heat pump in their house, which has reduced their energy bill and made the temperature of the house more comfortable throughout the year. The design takes advantage of the moderate temperatures in the ground to boost efficiency and reduce the operational costs of heating and cooling systems. My home country Norway is an oil rich country, but also a large producer of renewable energy. We have made use of our copious resources in hydropower, wind power and bio-energy from wood. Despite the fact that our wealth stems from oil, the government promotes policies that favor the use of renewable energy, which in turn prompts citizens to take on the challenges of climate change. There is no doubt that we will one day extract the last of the planet’s reserves of oil and gas. Thus we all have to look towards the future at other energy sources that in principle will never cease to exist. The sun will shine, the trees will grow, the wind will blow and the waves will slosh. Governor Cuomo and New York needs to take a leading role transforming the energy system to focus on clean energy technologies. Long Island is a place where you can clearly see the devastating effects of climate change, for example with the super storms Irene and Sandy. You can also see Long Island’s potential to be a center for production of clean energy. New York’s energy future should not be about the extraction of fossil fuels, but about looking generations ahead and establishing a cleaner and safer environment right now. 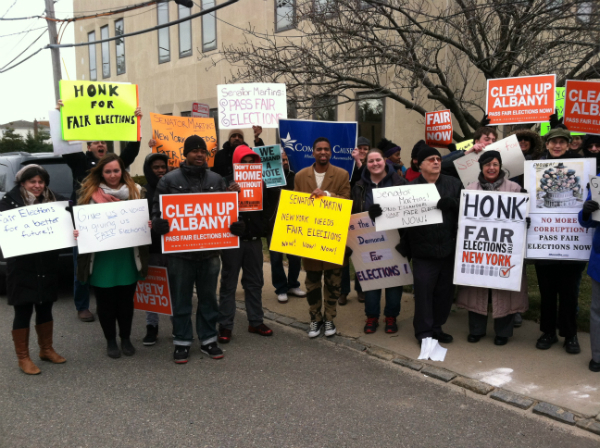 (Garden City, NY) Area residents joined with labor unions and progressive advocates on Wednesday in rallying outside of Senator Jack Martins’ office, protesting his refusal to support a proposal by Governor Andrew Cuomo to create a system of publicly financed elections. Represented at the rally were Long Island Progressive Coalition, the Working Families Party, Communications Workers of America, Common Cause New York, United Auto Workers and MoveOn.org. “After years of corruption and broken government, Governor Cuomo has included a Fair Elections system of lower contribution limits and small matching funds, ensuring we’ll see more candidates running and more participation from small contributors. Polls consistently show that a vast majority of Republicans, Democrats and Independents support these reforms. Today, I’m asking my Senator, Jack Martins, to stand with his constituents and not the special interests that seem determined to keep the status quo. Senator Martins: Keep Fair Elections in the budget,” said Port Washington resident and Common Cause member Phil DePaolo. The Fair Elections proposal would create a public matching system for small dollar campaign contributions, giving everyday voters an equal voice in the political process. Candidates who opt into the system wouldn’t have to rely on big money donations from well-connected insiders and can instead focus on catering to their constituents. Cuomo included the proposal in his 2014 Executive Budget, which is currently being debated by the legislature. My name is Frankie and I currently engaged in an internship with the LIPC. I am a junior at LIU Post studying sociology. I must admit, prior to accepting this amazing offer to work with such a hardworking, and dedicated group of people I was extremely nervous and felt as if I was in the dark. I am not proud of the fact that I had intentionally ignored politics and anything that had to do with them. Partially due to ignorance, and age. I thought to myself “I am spending most of my time to studying sociology, what could that possibly have to do with an involvement in politics?” One month later, I have a completely different mindset. With the help of the coalition I was able to realize not only the importance of politics, but the connection to sociology as well. Once I was able to make this connection (which came rather quickly and obviously) I was able to fully commit myself to making the most out of this opportunity. If there is one thing that is embedded in my mind from all of my passionate sociology professors at LIU Post, it is the concept of the sociological imagination. This concept helps us to understand that most issues that occur for one person, or even a small group of people, usually end up being broad scale issues that are important to many. A great quote I have heard over and over from my professors to explain this is: “The personal is political” which was used to great extent in feminist sociology; panning out on one women’s issue to reveal that it is actually the issue of many. In relation to the work with LIPC, I have seen that if one school district is having issues due to cuts and underfunding, it is usually similar issues to many others across the state. That one school’s issues now become not just their problem, but the problem of multiple schools and people in those communities; which is then where politics can come into play, to help solve the issues of many of these schools. Now I must ask, what is the best way to solve or improve broad scale issues amongst a large group of people? Well I’m sure most of you already put it together; it is politics. Laws and policies over time have constantly affected and determined many social actions and constructions amongst many people, creating oppression, inequality, equality, and liberation amongst races, class, and gender; which are the most popular subjects of study in sociology. I am so enlightened and grateful for this opportunity I was given by the LIPC and my professor. I was able to step out of my comfort zone, and I am now learning so many wonderful and useful things in relation to sociology, as well as learning a great deal about politics in the process (and enjoying it might I add). I am very eager to continue my time here and can’t wait to participate in some of the wonderful events that the LIPC is hosting and involved in. Speakers at a forum on public corruption this week said the state’s anti-corruption commission should push for campaign finance reform when it reports to Gov. Andrew M. Cuomo on Dec. 1. At the event Monday organized by the Long Island Progressive Coalition, the League of Women Voters of Nassau County, Common Cause New York and MoveOn.org, more than a dozen speakers said public financing of campaigns would help curb corruption because candidates and public officials would not be beholden to large donors. “We have watched year after year as the big money contributions drown out the voices of ordinary New Yorkers,” said Susan Schilling, a Huntington resident and member of the coalition. Lisa Tyson, director of the Massapequa-based Long Island Progressive Coalition, said the group would to forward testimony to Gov. Andrew M. Cuomo’s Moreland Commission to Investigate Public Corruption. Cuomo convened the panel in July to probe public corruption following the arrests of several state lawmakers on corruption charges. Tyson said the groups decided to organize a local public hearing after learning that the Moreland Commission had scheduled hearings only in New York City and Albany. “While we are glad that the Moreland Commission is doing the work of investigating public corruption, we were upset that they decided not to come to Long Island to hear from Long Islanders,” Tyson said. Emails and calls to Cuomo’s press office seeking comment were not returned Tuesday. Jonathan C. Clarke, a Levittown Democrat who ran unsuccessfully for Nassau County Legislature against Legis. Dennis Dunne (R-Levittown) on Nov. 5, told about 40 spectators he spent about $1,000 on his campaign, choosing to focus less on fundraising than on speaking to district voters. “This is a plea to politicians: Don’t worry so much about the money, worry about the message,” Clarke said. Felix Procacci, a Franklin Square Democrat who lost on Nov. 5 to Republican Hempstead Town Supervisor Kate Murray, said municipalities should post contracts online and provide online videos of all public meetings to increase transparency. “Ultimately, what it comes down to is people need to know what their government is doing,” Procacci said. My name is PJ Lydon and I am a senior in LIU POST. I have been yearning for a calling in my life and I love to try out different things. Presently, I have four jobs and I am taking 18 credits this semester, my senior year. My major is sociology with a minor in criminal justice. My professor and I have been searching for the right internship for me since the spring, when I explained to her that I wanted to be able to help people in need. My professor, knowing of LIPC’s desire to help Long Islanders with programs such as Power Up Communities, helped guide me to this internship. I have been an intern in LIPC for just a under a month, here, I work Monday, Wednesday and Fridays. I have been greeted by a wonderful staff and their diligence to the job inspires me, they are quite passionate about being able to help others. My supervisor is John Delaney, the Office Administrator. Mr. Delaney is quite the well rounded gentleman, he is constantly working on various projects, is a pleasant speaker, as well as an enthusiastic mentor. With Mr. Delaney’s guidance, I am doing research to help ensure further development of the organization, as well as making phone calls, which is one of the fundamentals of organizing the principles upon which the LIPC was founded upon. My main goal is to be a College Professor, one who is able to recognize the social inequalities that face many Americans daily. It is a goal of mind to have the ability to have a job working with emerging adults; I truly enjoy working with people, this has led me to volunteer on campus for a program in which I mentor and guide fellow students studying here from aboard. The youth are the key in solving inequalities, by learning about the different inequalities of intersectionality. One area I hope to learn more about and research is gangs. Their social structures fascinate me; in researching different gangs; I could focus on the reasons why people join them, what draws them to this way of life, and learn about what happens when members leave the gang and rejoin society. I want there to be a sense of justice in our political system and show people with my research that there needs to be more awareness of the consequences of these need to more aware of the consequences of gangs. I want a vast knowledge of the inequalities that communities face, the LIPC has been able to show me that working as a whole we could slowly eliminate inequalities and help save people’s money and improve the lives of Long Islanders. My goal is to improve myself one day at a time; I want to grow my mind, body and soul. The Ethical Humanist Society of Long Island will host a free community seminar on the Affordable Care Act on Wednesday, October 2, 2013 at 7:30 p.m.
“The New Health Care Law: What It Means To You” brings together community outreach and public health experts to educate the public about obtaining health insurance, enrollment specifics, preventive and wellness care, controlling costs and how the law benefits uninsured and underserved individuals. Expert panelists include: State Senator Kemp Hannon, chair, Senate Health Committee; Kelly Ann Murray, Director of Healthcare Programs for the Health & Welfare Council of Long Island; Jacqueline Moline, MD, Vice President of Public Health, NSLIJ Health System and chair of population health, North Shore University Hospital, Lisa Tyson, director, Long Island Progressive Coalition (LIPC); and Kenneth Feiffer, associate dean, Icahn School of Medicine, Mt. Sinai Hospital. A Q&A session is planned, following panelist presentations. Health insurance exchanges begin signing up consumers on October 1. Attending an information session early in the process gives attendees ample time to shop around for the best plan, armed with the necessary knowledge to make informed decisions, Dame said. Starting January 1, 2014, the Affordable Care Act requires everyone to have at minimum, a basic health insurance plan or pay a penalty. The Ethical Humanist Society is located at 38 Old Country Road, Garden City. Admission to the seminar is free, but space is limited – anyone interested in attending is asked to RSVP to 516–741–7304.